What is a thermal cooker and thermal cooking? The short. Think crock pot but cordless and non-electric. A thermal cooker is a cooking appliance that slow cooks like a crock pot but without requiring constant electricity. It uses vacuum insulation to trap heat from the inner pot of the thermal cooker and then completes the cooking process without any gas or electricity. Thermal cooking allows the full release of flavors by slow cooking with trapped heat in an insulated cooker. This prevents ingredients from burning and ensures meat and vegetables retain their shape and color. The objective of a thermal cooker and thermal cooking is to cook with minimal power and zero supervision. This translates to savings in time, gas and money. The concept of thermal cooking is not new. It dates back to the medieval period in Europe. In the past, thermal cooking was made possible by heating a pot of food over fire before placing the pot into another larger pot or hole which is insulated with hay, moss and dry leaves and then covered. Modern thermal cookers today retain the same cooking principles but with improvements in technology, they are much more convenient to use. They consist of two pots; an inner stainless steel pot contained within an outer insulated container. Some thermal cookers have a second inner pan for cooking a separate dish simultaneously. How does a thermal cooker work? To simplify how to cook with a thermal cooker, ingredients are first brought to a full boil before placing the inner pot into the outer container of a thermal cooker. Once the lid is put on for both the inner and outer pots, residual heat inside will allow all the ingredients to continue cooking slowly on its own. 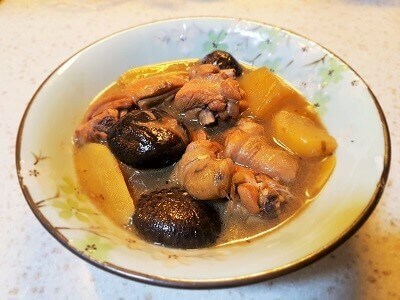 Here are pictures of a chicken stew with mushrooms and potatoes that I made in the thermal cooker for the first time. I browned some chicken and garlic in the pot before adding mushrooms, potatoes, seasoning and water. I realized that I could’ve put in more ingredients to fill up the pot more so I was concerned that the dish would not turn out well. As you can see in the picture, it was only about 1/3 full. I went ahead with the cooking as I was curious to know the final outcome. I lightly browned some chicken and potatoes in the inner pot before adding mushrooms, seasoning and water. The stew was brought to a full boil on the stove for about 20 minutes with the lid on. I turned off the heat and carefully placed the inner pot into the outer container. I was mindful to grip the handles firmly. This is how it looked once the inner pot is inside the outer container. Put the lid on for both inner and outer pot to start the thermal cooking process. The stew was left to cook on its own in the thermal cooker for 2 hours. The cooked stew after 2 hours. 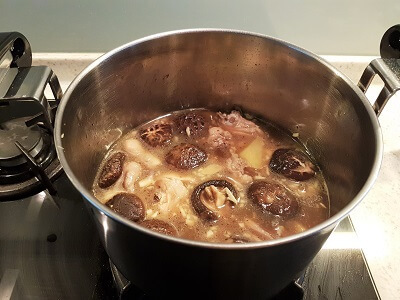 I was surprised and very pleased that the chicken was soft and the mushrooms (which were the thick meaty kinds) retained a good bite and were tasty. The potatoes were a little too soft for my liking but my kids loved it. The fuller the pot, the less amount of air is present in the inner pot so temperature can be retained for a longer time. However, that does not mean filling the inner pot to the brim. Check with the manufacturer’s guidelines. Some thermal cooker models recommend not to exceed 80% of the inner pot. If you are using frozen ingredients, thaw first before cooking for food safety purposes. The food has to be completely hot before it is transferred into the outer container. Bring all ingredients to a rapid boil before transferring the inner pot to the outer container to slow cook. The transition from the stove to the thermal cooker has to be quick to minimize heat loss. Don’t open the lid unnecessarily before the cooking is finished to prevent rapid heat loss. Whatever you do with a thermal cooker, DO NOT use the outer container to cook! Doing so will totally ruin the thermal cooker. Only the inner pot can be used for cooking on a stovetop. Not all outer containers can be washed. For detailed information on caring for your thermal cooker, check the manufacturer’s instructions as only certain units (such as this Tiger NFH-G450) have a washable outer container. For me, using a damp cloth to wipe the outer container is sufficient. The inner pot is easy to clean. Just wash it with water and detergent as what you normally would with your other pots. Initially, I was rather skeptical how a short cooking time would render food that normally require hours of cooking to be fully cooked and safe to eat. I mean, 30 minutes or lesser of cooking a stew, curry, soup and what-not and it will be ready in a few hours without any power source? Not only that, it could even cook rice, cake and yogurt?! Curious and intrigued, I went ahead and bought one. Within the first week of using it, I was asking myself why didn’t I buy one earlier. The convenience and freedom it offers to me is priceless. Once, my younger daughter had a fever and I had to bring her out to see a doctor. I quickly prepped all the ingredients I needed for a soup and boiled it for about 20 minutes on the stovetop. Then I transferred the pot to the thermal cooker and went out. The food was hot and ready when we returned home for lunch. Before getting a thermal cooker, there have been many occasions where I had to stop cooking halfway to run some errands, fetch my kids from school, etc. I wanted an appliance that would help me cook while I was out without leaving an electrical appliance turned on. A thermal cooker does that. And more. On days when I’m at home, it saves me time on cooking as I do not have to watch over the pot. Once the food is transferred to the thermal cooker, I’m free to play with my children, watch the tv, work, etc. It’s happy days in the kitchen. 1. Unlike conventional cooking (stovetop, slow cooker, oven, etc) it is impossible to overcook or burn your food because liquid will not dry up with thermal cooking. 2. No electricity is required and short cooking time on the stovetop. Even though a thermal cooker isn’t exactly cheap, you’ll easily recoup the cost from savings in energy. 3. Set it and forget it. Cook in the morning/night and come back/wake up to warm food. The food will be ready for you when you are. 4. Keep your hot foods hot and cold foods cold. It not only cooks and keeps food warm for at least 8 hours but it can also be used as a thermal cooler. 5. Retains the taste and shape of all the ingredients in the pot. Food does not break apart. 6. Portable and cooks on the go. It’s easy to bring out for road trips, potlucks, picnics, camping, special events, to the beach, on the boat, etc. 7. It is a safe cooking appliance. You can leave the house without worrying about forgetting to turn off the stove or power. 8. Cooks and saves space. Once the inner pot is placed in the outer container, it frees up space on your stovetop. 9. Considerably lesser clean-ups because the cooking is encased in the thermal cooker. 10. Highly nutritious meals. Since no evaporation occurs and it only requires a short cooking time on a stovetop, more nutrients and moisture is retained in the food. 11. A thermal cooker is perfect for sous-vide cooking (cooking in a specialized boiling bag immersed in water). 12. Perfect for busy individuals and families. No more watching over a pot. You can focus your attention elsewhere and have more time to enjoy with your loved ones. 13. A hot meal anytime, anywhere. Even if you live in a remote location with erratic electricity supply, you can still have a healthy and warm homecooked meal. 14. Alternative form of cooking. It is a great cooking utensil to add to an emergency preparedness supplies list. 15. Versatile cookware. Make soups, stews, yogurt, curry, pulled pork and more. See what you can cook with a thermal cooker here. Below are popular brands of thermal cookers made by various companies in no particular order. Ever since I bought my Tiger thermal cooker (review here), I’ve been using it to make most of my slow cooking soups. It works like magic for soups; extracting the flavors from meat and vegetables even though I just boiled the soup for a short amount of time on the stove (30 minutes if I’m in a hurry and 45 minutes to an hour if I have more time). Sometimes, I don’t even need to season my soup as I find it already flavorful. No wonder a thermal cooker is sometimes called a magic pot! All Tiger thermal cookers are vacuum insulated which is reportedly better than foam insulated to keep the heat in. I like that the inner pot has a slightly wider base compared to the other cookers so I can cook more comfortably. When I cooked a stew, the chicken turned out reasonably tender even though I only filled the pot 1/3 full. I guess it is due to its vacuum insulation. Hence the higher price but it is worth it to me. Tiger thermal cookers come in various sizes. Check them out here. 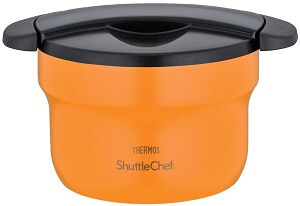 Thermos is the maker of the world’s first thermal cooker – its Shuttle Chef® series revolutionized cooking with energy and time savings convenience. This brand is still going strong today and has various thermal pots to suit your requirements. All their thermal cookers are vacuum insulated and are induction ready. Compared to Tiger, Thermos thermal cookers are taller and slimmer. If you like to have a pop of color in your kitchen as well, certain units also come in colors like peach, apricot and white but take note that that the peach and white unit is on the small side (1.6L). 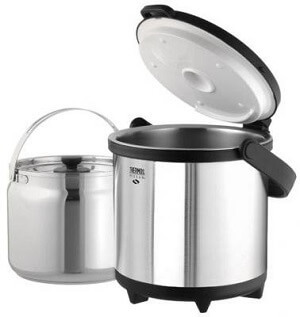 If you wish to cook 2 dishes at the same time, the Thermos 6 liter model comes with two stainless steel 3L pots. What I like about Saratoga Jack’s thermal cookers is that their thermal cookers come with a second inner pot so you have the flexibility of cooking 2 dishes at the same time. They are also cheaper than Thermos and Tiger possibly due to the foam insulation. All Saratoga Jack’s thermal cookers are made of 304 – 18/10 surgical stainless steel. Their cookers come in 2 sizes – 7L and 5.5L. The 7L cooker also comes with a deluxe version. If you’re a thermal cooker user, do share with us your thoughts and experience with your thermal cooker. 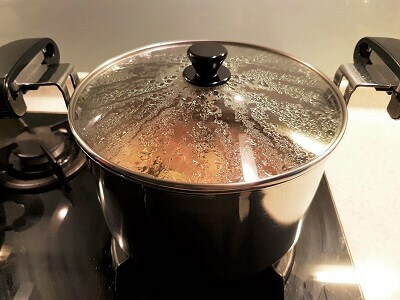 For tips on choosing a thermal cooker and a more comprehensive review on the best thermal cookers, check out this article. Please share this post and if you have any questions or comments, I would love to hear from you! I have used our thermal cooker for years in our RV. I start the food in the morning before we leave and put the cooker in the sink for travel. It is so nice to stop for the night and have dinner ready. Otherwise, after a long day on the road it’s so tempting to head for a restaurant. I have also used it to take my donation for church suppers because it travels so well and is easy to carry….no spills. I have the all steel Thermos model. Some thoughts on food safety. It is fairly easy to figure out how long it will take your food to lose temperature down to 140F/60C. If you use the 6-8 degrees for foam or 3-5 degrees for vacuum. The food starts at boiling, whatever that may be for your location. Calculate the number of hours you are leaving the pot and multiply by the degrees lost. Keep in mind there is a four hour window for food safety. The food has to be at or below safe temps for 4 hours before it is unsafe. If you are worried that you might be cutting it close you might insulate the whole cooker in blankets and pillows. Finally an instant read thermometer is your friend. If you check the temp when you open the pot and it is low just reheat to 165F degrees for 5 minutes. That is unless you know that the temp has been too low for more than four hours. I have never had a problem with my foam insulated pot for 8 hours and even more. Your situation may be different. Thanks for sharing, Steve. I usually cook with the thermal cooker in the morning and if I leave it till the evening to consume (more than 6 hours), I’ll take it out for a quick boil on the stove. I’ve not tried a foam insulated pot before. It’s good to know that it works just as efficiently too. My triple layer top pot arrived from Saratoga Jacks today. Here is a very curious revelation: It fits perfectly inside my 5L pot!!! That means that two meals in one pot is possible in the 5L as well. It cuts the pot in half so the second meal can’t be as big as in the 7L pot. This opens many more possibilities for multiple meals but also smaller meals as well, conceivably a small meal in the 2.5L top pot and boiling water in the bottom. Wow, that’s great! 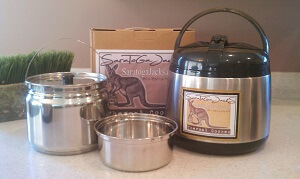 Is your Saratoga Jacks triple layer top pot the 5L or 7L one? I bought the triple layer top pot to go with my 7L but it fits the 5L ,too. I have not read all the comments but wanted to add my experience. 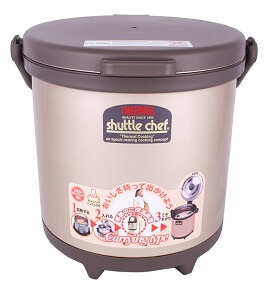 My first thermal cooker is the 1.6L Shuttle Chef. I prepare steel cut oats for breakfast, starting them the night before. My second pot is a Tayama 5L. I have made soups and curries and lamb shanks. I just purchased my third pot which is a Tayama 7L with the single layer inner pot. I purchased a triple layer inner pot from Saratoga Jacks. The heavy duty inner pot hasn’t even arrived. I am very interested in recipes that utilize the inner top pot. I am excited to make my first batch of rice but I want to do more. I’m so happy to hear from someone who does thermal cooking and looks like you’re a big fan! 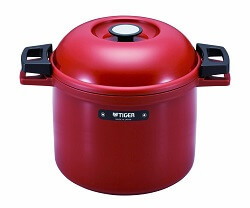 For me, currently I’m using the Tiger 5.2L thermal cooker. It’s a handy product to have in the kitchen. I only wish that it came with a second inner pot so that I can cook 2 dishes concurrently. For recipes that uses the inner top pot, check out this Thermal Cooking Cookbook by Cindy Miller. She uses Saratoga Jacks thermal cooker too. 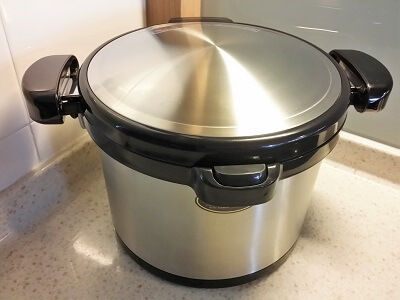 For recipes that uses the single inner pot, you can refer to my thermal cooker recipes here. I’m not sure if I understood you correctly but did you purchase the Saratoga Jacks triple layer inner pot on its own without the outer pot? I bought a Tayama 7L from Amazon. It came with a single layer pot. So, I ordered the triple layer pot from Saratoga Jacks website. From what I can figure Tayama makes Saratoga Jacks under a private label agreement. After buying the cooker with a 30% discount on Amazon and the extra pot I was still money ahead. I didn’t know that Tayama makes Saratoga Jacks under a private label agreement. How do you find the Tayama thermal cooker? What a great idea. Can I find this in Kuala Lumpur, or is it only available online? Can the inner pot be used on a gas stove top? For a family of 2, do you think a smaller one than the one you have will do? I am thinking of making soup and stew in it. Thanks for writing in. Yes, you should be able to find it in KL too. The inner pot can be used on a gas stove top. For a family of 2, I would suggest that you get a smaller sized pot but large enough to contain all your soup/stew ingredients. Thank you for sharing the useful information. Have you ever tried leaving the food inside the thermal cooker for 8-9 hours? Say, you boil the soup in the morning (8.30am), leave the house, come back at 6.30pm, will the soup be ok? i’m a working mum and have relied on slow cooker so far. considering thermal cooker as I often worry about leaving an electric equipment on in the house. any review on takahi brand? 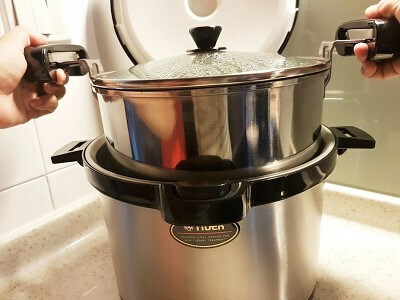 i use takahi slow cooker, so far so good, but the takahi thermal cooker ($42 in lazada) is much cheaper than tiger and thermos, so I wonder whether the quality is good. Thanks for writing in. Yes, I’ve done it before and it’s mostly when I boil a soup. I cook the soup for lunch and leave it in the cooker till dinner time. I will re-heat the soup before drinking if it has been in the cooker for 8 hours or so. A thermal cooker is very convenient for busy moms and individuals as it can cook without an electrical source. I don’t have a review on takahi brand as I haven’t tried it before. I checked out the $42 takahi thermal cooker that you mentioned. The size is only 1.5 l. Consider what you’ll be using it to cook. For me I boil a lot of soups, so I would definitely need something larger. I was curious to know this myself. I love it! Seems like you would use a lot less energy and also sometimes I forget I have things cooking and then I end of scorching the bottom. What a wonderful idea! After two hours, the food was still hot and ready to eat? You didn’t have to reheat anything? Sometimes, I do forget that I’ve food cooking on the stove too especially when I’m busy. Yes, the food is hot and ready to eat after 2 hours. I didn’t reheat as I find that it wasn’t necessary. If you leave it in the pot for longer,say about 6 – 8 hours then you may wish to re-heat but the food is still warm though. I never heard of a thermal cooker before this is interesting to me. Can it do everything a slow cooker can do and more? It does seem quite expensive. You’re not alone there. There’re many others who’re also unaware of the thermal cooker. Yes, it can cook like a slow cooker but I’d have to say that taste wise, it might not be as robust tasting as food cooked in a slow cooker. But still, the many benefits of a thermal cooker (which you won’t find in a slow cooker) is invaluable to me. Some thermal cookers are more expensive due to the vacuum insulation method used. The cheaper models are made with foam insulation and most of them work well too if you read the reviews on Amazon. For example, these reviews on Saratoga Jacks thermal cookers. I actually have never used the thermal cooker before. Somehow it looks heavy to me. But I agree with you on its good multi-functioning. I would try to look for one. Thanks for sharing! Most of the time, my thermal cooker stays stationary on my kitchen countertop so the weight is not an issue for me. It also did not feel excessively heavy to me when I tried to lift it. Smaller thermal cookers would be lighter if weight is a concern. Personally, I would look for a smaller sized thermal cooker if I were to buy another one. Great article! Love the images especially with a “how to”. I have heard of thermal cookers but I didn’t really know what they are and what they can do. I think this would be a great way to cook especially in the summertime to avoid heating up the house and to also keep things cool when bringing to a picnic for example. With slow cookers, I have always been uncomfortable leaving them plugged in all day especially if I have to leave the house and it seems that this would be a better alternative. Thanks for writing in. A thermal cooker does not heat up the house when cooking and also, there won’t be any strong lingering smell in the kitchen once food is left inisde to cook. It works like a slow cooker.. but with benefits. You’re right, it is a better alternative. 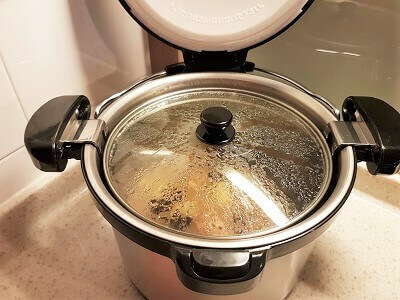 This was very interesting for me because I had never even heard of such a thing as a thermal cooker, but after reading your very thorough review I just might need to try one! I am a very frequent crockpot user myself but I think that this would be an excellent choice for the reasons you mentioned, especially the one about racking up a utilities bill. I too did not know of the thermal cooker until last year (2015). It has won me over with its ease of usage, convenience, savings in time and money and so much more. I will test out new recipes with the thermal cooker so stay tuned! Very informative article here. My wife absolutely loves these things. But our son broke hers not to long ago. I’ve been telling her that I’ll get her another one. But I was hesitant because I didn’t know of any good ones out there. After reading this I have no doubt in my mind now. Thanks to you my wife will be getting her thermal cooker very soon. Thank you so much for the help. Thanks for your comments. I love these things too. I’m glad this article will help you to make an informed choice when considering which thermal cooker to get as there’re so many to choose from. Have a great week ahead. I have not heard of a thermal cooker before and this sounds interesting. I usually use a slow cooker for chillis and stews that need a long time to get the flavors out. Is the main difference then between the slow cooker and thermal cooker is the electricity? I would rather not add another appliance unless it does a better job than an existing appliance. I’m glad you brought up this question. There are so many differences between a thermal cooker and a slow cooker. Although I wouldn’t say it can replace a slow cooker entirely, these are some of the things that you can achieve with a thermal cooker but not a slow cooker. 1. 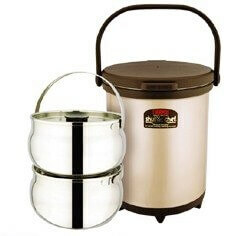 Portability: A thermal cooker can be brought out to an outing trip as it continues to cook and keep warm. A slow cooker needs to be plugged in at all times for it to work. Therefore, it is not possible and is inconvenient to bring out. 2. 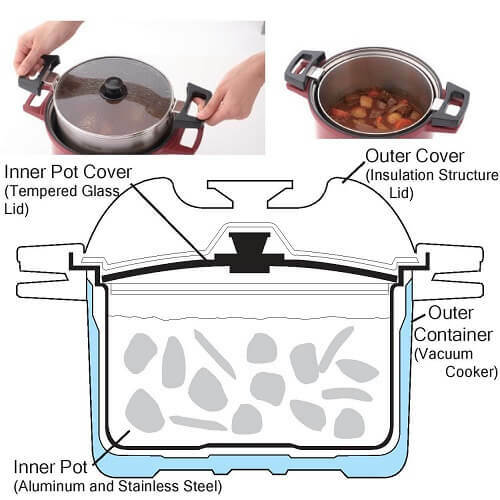 Multi-purpose: A thermal cooker can keep hot food hot and cold food cold. 3. Cooking ability: It is impossible to burn your food or overcook them in a thermal cooker as temperatures drop steadily every hour. In a slow cooker, there is a higher chance of over-cooking especially if using an older model without a programmable timer. 4. Less actual cooking on a heat source: That translate to savings in fuel and money. 5. Versatile: It is possible to make bread, cakes and yoghurt in a thermal cooker. 6. Convenience: A good appliance to use in places where electricity is erratic and also in times of emergencies. You can absolutely cook chillis and stews in a thermal cooker with power savings to boot.